Norman Friedlander speaks to Morlier’s Abnormal Psychology Class. 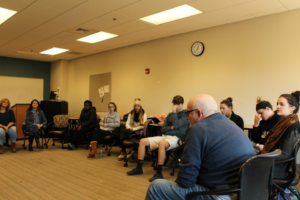 In Debra Morlier’s abnormal psychology class at Frederick Community College, students sat in a circle reminiscent of those in 12-step programs. Norman Friedlander is a recovering addict and a student at FCC. 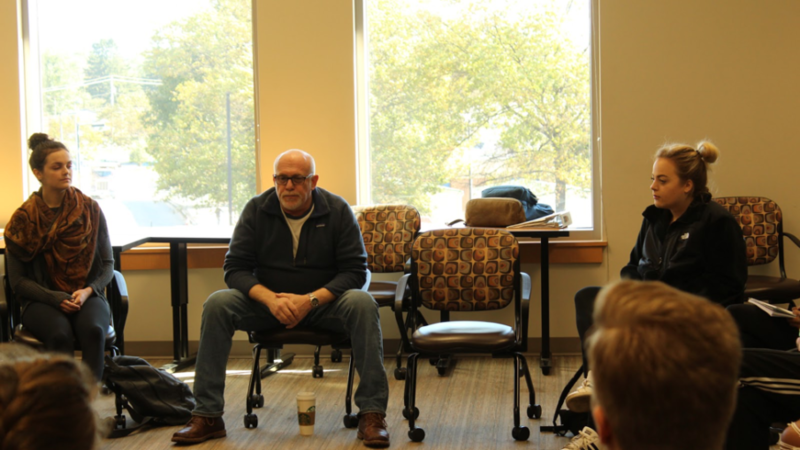 He has been coming to Moriler’s Abnormal Psychology class as a speaker for the past two semesters to educate students first hand on what it is like to live with an addiction. Friedlander speaks casually and intimately to the class, in a way that takes the subject seriously, but not himself. Friedlander talked to the class about what makes someone more vulnerable to developing an addiction, from mental illness, genetics, and socioeconomic status. Friedlander’s history with drug abuse started at a young age, first exposed to cocaine, but it soon developed into opioids. Norm had a job as a pharmacy technician and store manager for years, where he worked closely with prescription drugs. Friedlander expanded on why people were confused as to why he would go back to a job he knew would be triggering. The Abnormal Psychology listens as Friedlander shares his life experince. Withdrawal from drugs like opioids and benzodiazepines can be very dangerous, from symptoms including shaking, cold sweat, nausea to more intense reactions such as seizures or even death. It was not until Friedlander overdosed that he hit rock bottom, often an essential piece needed before recovery. “I needed 4 shots of Narcan. I flatlined once in the ambulance and I was in a coma for three and a half days after I overdosed,” Friedlander said. After this, the hospital transferred him to an inpatient program at a hospital for nine days where he continued to detox and go through withdrawal until being sent to a 30 day rehabilitation. Friedlander also attended Narcotics Anonymous (NA) meetings every single day, sometimes multiple times a day. Friedlander has been drug free and abstaining from alcohol for over a year and a half now. Friedlander assured that he is still early in the recovery process for alcohol. After retiring from his pharmaceutical job, Friedlander found himself with a lot of time on his hands. Friedlander has been working on getting his certificate in addiction counseling and is planning on graduating in the Fall of 2019. After that, Friedlander would like to go to Hood College to get his Masters Degree. Summer Gratia, a student in the Abnormal Psychology class, shared her opinion on Friedlander’s visit. Debra Morlier, professor of the Abnormal Psychology class, shares why Friedlander visits from time to time. As the class came to the end, Friedlander had a special phrase he shared with the class that often worked as a mantra between people with addictions. “Don’t pick up, keep coming back.” Friedlander said. Friedlander was referring to not picking up drugs, and to keep coming back to 12-step meetings.